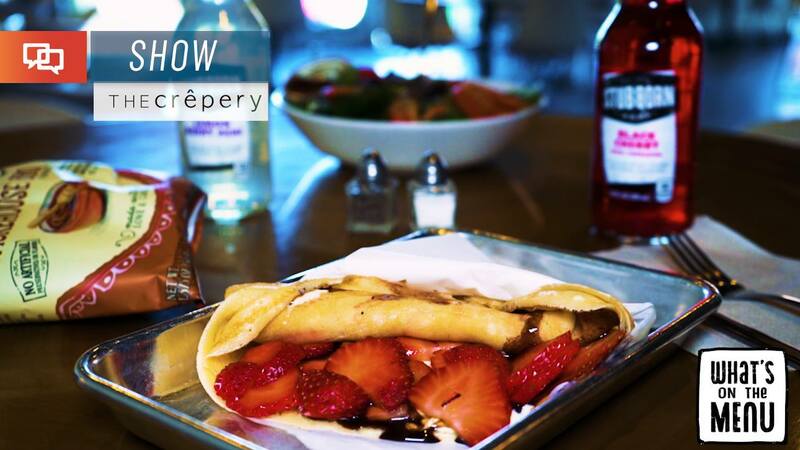 FEATURE — The Crêpery, a boutique restaurant and coffee shop located on Bluff Street in the heart of St. George, has been voted to have the best crepes in Utah. Its staff strives to provide plenty of delicious evidence to support that claim, creating everything to order using the freshest and best-quality ingredients. “We aim to keep ourselves as your number one cafe for the best crepes and specialty drinks around,” states The Crêpery’s website. Watch Sheldon and Jessica’s visit to The Crêpery in Episode 25 of “What’s on the Menu” in player above. Shift supervisor Artesia Dalton says that when it comes to the most popular crepes on The Crêpery’s menu, one of the top choices is the savory Mac Daddy, which is made with chicken, bacon, avocado and mozzarella cheese, with a special dill creme cheese sauce. Another favorite is the sweet crepe called the Pin-Up, which contains strawberries, cheesecake filling and chocolate sauce. Another top-selling sweet crepe option is known as the Nutie Fruitie, which contains either fresh bananas or strawberries, blended with Nutella. The store’s menu also features a small selection of salads, including the Athena Salad, which contains spinach, arugula, Roma tomatoes, olives, oregano and feta cheese, topped with either raspberry vinaigrette, poppy seed or balsamic dressing. The restaurant’s wide-ranging drink menu includes various coffees, espressos, fruit juices, lemonades and sodas. Not listed on the menu but still available are fruit smoothies, made with mango, peach or pina colada. Another secret not mentioned on the menu is the fact that anyone – not just children – can order half-size crepes, with the price adjusted at the register. On Mondays, a kids crepe is free with the purchase of a regular adult one, according to the advertised special. The Crêpery’s St. George location is one of three in Utah, the other two being in Logan and Provo. All three stores feature artwork by noted Logan artist Carrie Ellen Carlisle that is available for purchase. The Crêpery | Website | Facebook | Location: 1091 N. Bluff St. #311, St. George (click for map). | Hours: Open at 7 a.m. seven days a week. Closing hours vary (open until 9 p.m. Monday through Thursday, 10 p.m. Friday and Saturday, and 2 p.m. Sunday). | Telephone: 435-673-4106.